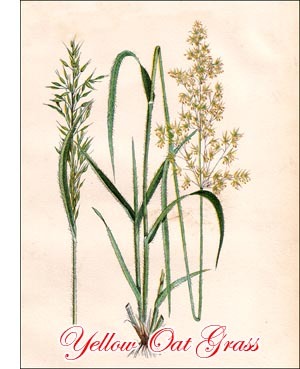 Other English names: Yellow False Oat, Golden Oat Grass. Yellow Oat Grass is perennial with a short rootstock forming loose tufts. The stems are from one to two feet high, very slender, and leafy to about the middle. Secondary shoots develop from the base of the stems. They sprout from buds within sheaths of old leaves and are at first enclosed by them. In the development of the shoots the old sheaths burst, and thus the base of the stems becomes surrounded by the ragged remnants of brown old sheaths. The secondary shoots produce quite a number of leaves. These, like those of the stems, are very soft in texture and covered with soft hairs. Their sheaths, as a rule, are also hairy. The flowers are arranged in a panicle, pyramidal in shape and with spreading branches during flowering time. After flowering, the branches turn upwards and the panicle thus becomes contracted and narrow. The numerous spikelets are green at first, but toward flowering time they turn a beautiful golden yellow-hence the name of the grass. After flowering they assume a duller, yellowish-brown shade. The spikelets contain three flowers, each of which is enclosed by two glumes. The outer glume bears on its back a delicate, somewhat bent and twisted awn. The fertilization is accomplished as in Tall Oat Grass. Yellow Oat Grass is indigenous to Europe, northern Africa and the temperate parts of Asia. It has been introduced into North America. It has been recorded only once as growing wild in Canada. It grows naturally in somewhat dry meadows, along roadsides, on the slopes and even summits of mountains, and in mountain valleys. Yellow Oat Grass is not fastidious about the soil, provided that other conditions are favourable. Although it stands some drought, it makes poor growth where the ground is too dry. It likes a fairly moist soil, rich in organic matter and lime. It is more sensitive to excessive moisture than to drought, stagnant water having always an injurious effect. Yellow Oat Grass is medium early, flowering a little later than Orchard Grass. When soil and climate are suitable, it makes a good stand in a short time and spreads readily. On account of its somewhat tufted habit, it should always be sown with other grasses. Its principal value is for bottom grass in hay mixtures, as it increases both the yield and the feeding quality. After cutting it produces a great number of new stems and leaves, and the second growth may be profitably used for either hay or pasture. All kinds of stock like it, and in some parts of Europe it is considered one of the most valuable fodder grasses. Experiments in Canada, however, have not given promising results. When sown alone, twenty to twenty-five pounds of seed should be applied to the acre. The commercial seed of Yellow Oat Grass is generally very impure, as it is always secured from mixtures with other grasses, especially Tall Oat and Orchard Grass, and afterwards separated by sieves. It is yellowish-brown and weighs from five to six pounds a bushel.